Exclusive 20% workshop discount is now available on Garage Commons - SIGN UP NOW for a free Commons membership to access the promotion! Looking to harness the power of Instagram to build your business? 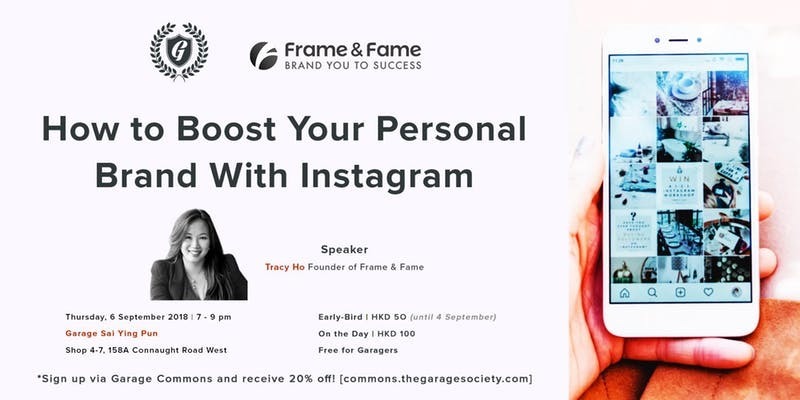 Join Garage Academy as we host leading personal brand strategist and founder of Frame and Fame, Tracy Ho, for a workshop on how to jumpstart your personal brand on Instagram with visual storytelling and engaging content. Tracy Ho is a leading personal branding strategist in Asia. She is the founder of Frame & Fame, a branding boutique in Hong Kong. As a certified coach, she helps entrepreneurs, startups, SME owners and corporate executives to stand out from the crowd with their talents, passion and unique propositions. Tracy and her team support clients to be seen and be heard as a leader in their fields by developing impactful personal brand stories, portraits and brand identity assets. Tracy is committed in supporting the startup communities in Hong Kong and Asia. She coaches top-ranking MBA students as well as mentors startups, incubator & accelerator participating companies on personal branding and communication related areas.